This blog started out as a rant and rave about GMO (genetically modified organism) containing foods and how disgusting it is that companies like Monsanto mess with Ma Nature and our food chain – all in the name of control and profit. Even now, it’s a bit of a challenge to hold back and not rant on about the various health issues that have been linked with genetically modified food, and then I realized that there are many websites that have all the facts and detailed info about GMO’s and how bad they are for us, and how they affect our mind and body, etc. (some of those sites are listed at the end of this blog). So, instead, I just want to simplify the whole GMO thing and provide a list of the worst of the worst GMO foods – the ones we should all be avoiding, at all costs. One thing I do want to make clear here (because I’ve noticed so much confusion and misinformation about it “out there”) is that there are varying levels of genetic modification applied to plants, and some of the minor modifications (e.g. tweaking genetic material so that the plant grows stronger) is not all that horrifying or dangerous. After all, our ancestors have been helping Mother Nature along for eons (hand grafting and pollinating weaker plants to make them stronger) without any harmful effects. What IS horrendous and horrifying is the genetic manipulation that involves literally inserting foreign DNA into the genetic material of the plant to make it resistant to certain insects or even pesticides. Those are the genetically modified/engineered foods that we should all be avoiding, as there have been no long-term studies to determine safety levels (duh, we all know that messing with nature in this kind of way cannot be good for anyone!). That said, many health specialists are now pointing the finger at GM foods for the increase in numerous health issues, including digestive conditions (e.g. Crohn’s, Colitis), infertility, auto-immune disorders (where the immune system attacks the body), inflammatory conditions, and cancer. Even worse is that companies such as Monsanto are partnering up with Pharmaceutical companies to create a way to implant medication and vaccinations directly into our food. If you don’t believe me, read the info for yourself. Google “edible vaccines” and a list of science-based websites, touting the awesomeness of this possibility, come up. Some of the ones I found are listed at the end of this blog. There is nothing awesome about inserting vaccines or medication generically into our foods! No matter the pretty picture these companies try to paint, the bigger picture is horrifying – and do you seriously think they’ll let us know which foods have been modified in this way? Of course they won’t! Sigh….I’m ranting again…. Anyway, you get the picture. So do a bit of research for yourself and you’ll be amazed (and horrified) at what you’ll discover. Here’s a list of GMO foods to avoid (in no particular order, although corn, soy, cotton, canola and dairy by far seem to be the worst). For more detailed info, visit the Natural Health News website (a couple of links at the end of this blog). 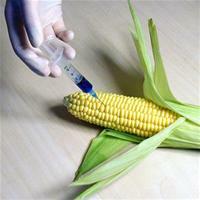 They have oodles and oodles of well-researched info about GMO foods and links to more info. (*) Dairy. This seems to be a huge issue in the USA being that its the only country in the world to still allow use of bovine growth hormone in the industry. This is not so much of an issue in Canada and many parts of Europe, where bovine growth hormone has been banned. Still, consider that many large-scale, commercial dairy farms very likely use GMO grown crops (e.g. corn) to feed their cows, and that IS an issue. I’m not going to give a summary of what and how each of the above is modified. For that info, visit the links below for excellent, detailed info (there’s no point in reinventing the wheel, right?). What I will add is that whenever possible, look for home-grown, organic food. Read labels on EVERYTHING (including organic packaging) and, if buying from a market garden, have a chat to the grower and ask what kind of fertilizer they use, etc. If they get offended by your questions, walk away. If growing your own food look for Heirloom seeds (a couple of links listed below) as these have been collected and passed down from generation to generation and have not been genetically modified (seeds produced by GM plants are designed to NOT grow; farmers are forced to buy new seeds every season). What? It’s bad enough already…. is there more? Sadly yes, there is more. GMO is one thing, but we also forget that many commercial farmers use a wide variety of chemically-based herbicides, pesticides, and fertilizers on crops at various stages of plant growth. These chemicals get into the plant and no amount of washing the end product (fruit, vegetable, or grain) will get it out. To get the point across, check out this short video by Elise…. and what she discovered while doing a simple science project for school. To read about Elise’s science experiment click here. Not all news about GMO is doom and gloom. In fact, there are many countries in the world that have stopped using GMO seeds and, instead, grow non-GMO food successfully. Studies have also shown that the cost of growing non-GMO and/or organic food often costs the same or even less than GMO food that is commercially grown. Take Lima and Peru for example. The local farmers only grow organic food (GMO’s are banned), and the food is available at markets for around the same cost as conventional food in the USA, or less. To read the full article, visit Minds.com (if you click on “Minds” it will take you to the full article). For a full list of countries who are moving towards (or already are) GMO-free, visit the Organic Consumers Association website. With regards to Dairy, how bad are the protein powders derived from whey? That will depend entirely on the original milk source; the more GMO foods the cow has consumed, the more likely those residues will be in the milk. You could look for an organic whey protein powder (try Planet Organic or online), or consider a plant-based protein powder, hemp protein is one of my favourites. It seems to be a lot easier to digest than soy or legume protein, and not as sweet as rice protein.